But when she is summoned to Avalon, Laurel's feelings for the charismatic faerie sentry Tamani are undeniable. She is forced to make a choice—a choice that could break her heart. I've been waiting a year for this sequel and IT IS FINALLY HERE! It is actually not suppose to be out until tomorrow in the UK, but I stopped by the book store on the way to work today to make sure they were going to have it...and well...it was ON THE SHELF! I grabbed it before anyone made me give it back. I was sneaking peaks all day at work to read this amazing tale. I took trips to the bathroom with the book. Hid it behind anything I could just to read. I truly LOVE this story. 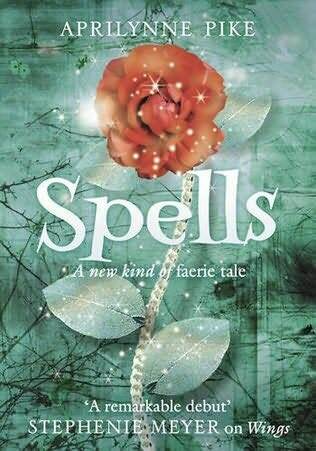 Spells is un-putdownable! Sure to be another NYT Best Seller! I'm completely invested. I need to know what is next. Aprilynne has painted us a very vivid picture of Avalon! I love her writing style and she has such a way to make the story flow and keep you hooked. I read it all today and I work full time. I love books that take me away into another world and this has done just that. Remarkable! The love triangle is still there and we get to see Laurel start to find her way as a faerie. I could totally live in this world Aprilynne has created. I can actually! Anytime I want to revisit I just need to pick the books up and Aprilynne will take me to Avalon. I know I'm going to read this book a million times before the next book in the series comes out! We do have quite a cliffhanger! It's killing me! I did want to strangle Laurel though. I can't believe what she did. I just can't believe it. It has ruined my night actually. You NEED to pick up this series! You won't be sorry! "I can't just storm in and proclaim my intentions. I can't ‘steal' you away. I just have to wait and hope that, someday, you'll ask," Tamani said. "And if I don't?" Laurel said, her voice barely above a whisper. "Then I guess I'll be waiting forever." OMG OMG OMG I am SO jealous. TEAM TAMANI! I love him! I so need to get Wings, this series sounds great. That's quite an endorsement! I'll put Wings on my ever-growing TBR list! I can't wait to read this!!! I've been dying since I read the first 6 chapters!